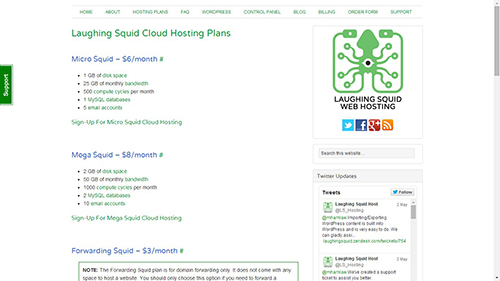 Laughing Squid Web Hosting gives you exactly two hosting plans: The Micro Squid and The Mega Squid. It doesn’t get any simpler than that. There is no doubt that this web hosting solution provider was created with “The Little Guy” in mind. Laughing Squid itself admits that its target audience targets is websites that are mainly content-driven, such as those owned by bloggers, artists, writers, musicians, bands, filmmakers and other creative individuals. Furthermore, Laughing Squid especially focuses on WordPress blogs. However, the company is so dedicated to its “keep-it-simple” structure that it might actually turn away websites that demand a lot of bandwidth or those that run too many scripts. Since Laughing Squid Web Hosting is built for everyone and anyone to be able to work easily – with as little help as possible – on its platform – everything is pretty straight forward. As a matter of fact, there is a chance that webmasters who are used to seeing lots of buttons and links to click on might either feel like they don’t have much control over the inner workings of their own sites or might actually be lead to think that not much can be done from their control panels because, after all, there is nothing to click on. Although it might seem like it’s a bit too small, Laughing Squid’s 1 GB and 2 GB (Micro and Mega hosting plans, respectively) are only the initial sizes. If you think you need to add a little more disk space, it can easily be done. As a matter of fact, you actually don’t need to do anything: As soon as your data exceeds the assigned quota, you are bumped up to the next plan automatically. When, later, you want to reduce your data and disk size, you can request to be bumped down to the previous, or an even lower, plan. Each bump up in a hosting plan will add 1 GB of disk space, 10 GB of bandwidth and 250 compute cycles. Excitingly, the cost of each addition is only $2. However, always make sure that your site is always monitored, because you will no longer be welcome at Laughing Squid if you exceed 10 GB of disk space, 200GB of bandwidth per month and 3000 compute cycles per month. Laughing Squid Web Hosting comes with the usual features: disk space, bandwidth, MySQL server(s) and email accounts or addresses. Other features that are added include the ability to host on Rackspace Cloud Sites’ own servers, a web based control panel that allows you, as an administrator, to access your website from anywhere, at any time, POP and IMAP email accounts (if you wish to have your emails handled on your own servers), spam filter to ensure that you don’t waste bandwidth on unwanted and un solicited traffic and FTP access so that you can directly upload and download your files. The PHP version Laughing Squid uses is 5.3 and the MySQL version is 5.1. You have phpMyAdmin to access and configure your site. Another great service that Laughing Squid offers is called the “Forwarding Squid”. As the name suggests, this service forwards your domain and requires 25 GB of bandwidth per month, 500 compute cycles per month and 1 email account. The price for forwarding is just $3 per month. Laughing Squid is especially proud that its hosting is highly compatible with WordPress. As a matter of fact, Laughing Squid proudly boasts that the company is actually recommended by WordPress itself. Laughing Squid’s customers usually contact support when they want to settle bills or have questions regarding payments. In the rare chance that you do actually have issues with your hosting, you have Laughing Squid’s support techs by your side. You’ll get 24/7 support. You can contact the support team by raising a ticket via phone, call or email. One novel way that Laughing Squid keeps its customers updated is by using social media platforms, which is great for those constantly on the go. Laughing Squid has just two hosting plans and just two prices for you to choose from: $6 / month for the Micro Squid and $8 / month for Mega Squid.